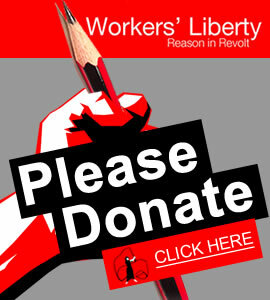 Please consider making a regular payment to Workers' Liberty to support our work. By PayPal: use one of the "subscribe" buttons below to make a regular payment via PayPal. By direct debit Click on the image below for the amount you want to set up a direct debit for. In the eurozone, make payments in euros to account IBAN: GB59 CPBK 0802 1110 0118 69, Bic: CPBKGB22. In Australia, make payments to AWL by internet bank transfer to account 515402 at Westpac, BSB 734-078. (Please email awl@workersliberty.org to notify us of the payment and what it is for).